The Jeff Beck stop in Nashville at the historic Ryman Auditorium last night brought more thunder in-doors than the storm that was encircling Nashville. Tyler Bryant, a promising young guitarist with a Texas lineage, who played at the 2007 Crossroads Festival at Eric Clapton’s invitation, warmed up the sold out crowd with some sonically altered Acoustic Guitar and Vocals. When Jeff Beck took the stage, the biggest change this tour was hearing Narada Michael Walden devastating a double bass kit, a blast from the past, who did tracks with Jeff back in the Wired days during the Jan Hammer era. There are only two drummers that play with that kind of power and style, Narada Michael Walden and Billy Cobham. A couple of great tracks from Wired, “Led Boots” and “Blue Wind”, gave him a chance to tear it up like he did back in the Seventies. If Tal Wilkenfeld was the added bonus last go-around, Narada Michael Walden more than made up for that. Rhonda Smith, Bassist-Singer, most known for gigging with Prince, offered some flexibility to do his version of “Rollin’ and Tumblin’” as well as Sly & The Family Stone’s “I Want To Take You Higher” during the encore set. I’m kind of glad I didn’t read previous reviews because I had no idea he was going to tribute Hendrix with “Little Wing”. 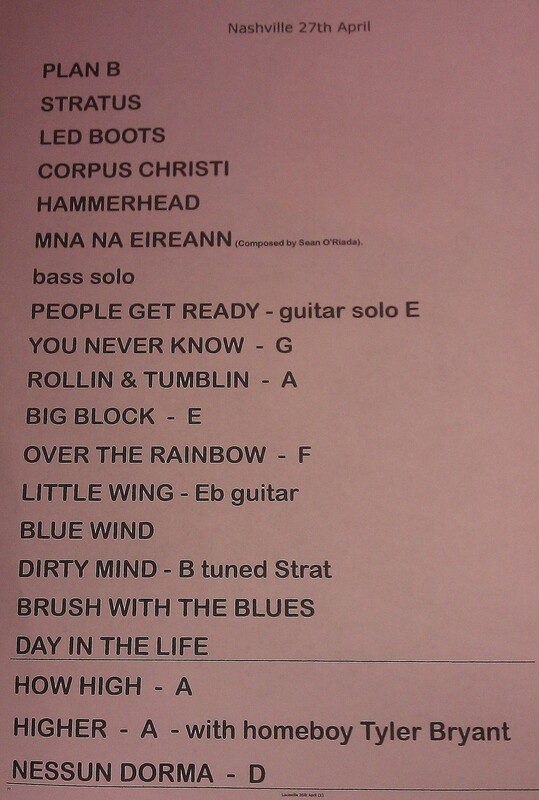 If there was a “close- to- God” moment it was during “Little Wing”. It was so sublime, if Jimi is an angel, I’m sure he was smiling. Jeff nailed material from Emotion & Commotion like Jeff Buckley’s take on “Corpus Christi Carol” as well as one of his standards over the last few years, The Beatles’ “A Day in The Life”. It is amazing what Jeff can get out of his fingers with a Fender Stratocaster. I have seen some players take Jeff Beck’s approach to solo lines but the tone and the in-between note stretches have never been duplicated in over four decades of guitar majesty. Jeff stretched from the Les Paul track “How High the Moon” to the Puccini Aria “Nessun Dorma” before disappearing into the tour bus in the alley at The Ryman. Tyler Bryant did an 11PM set at The Rutledge at an after-show with his full band. 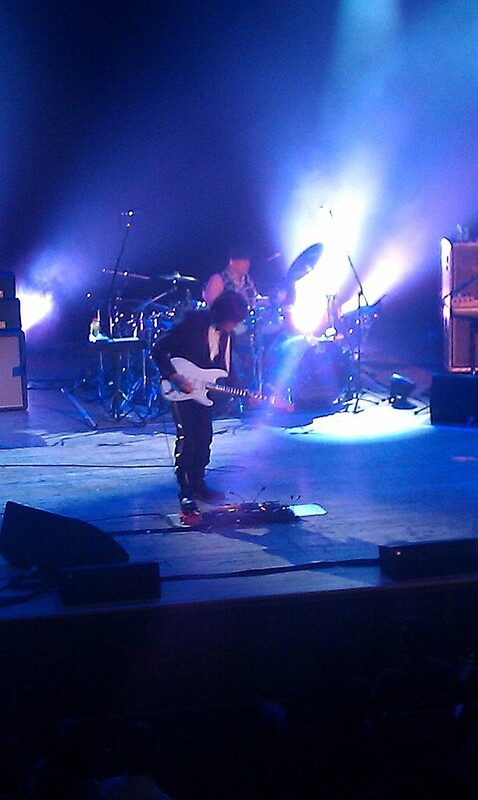 If you enjoyed any of the recent Jeff Beck live DVD releases, hearing him live takes it to the next level. If you get the chance, go see Jeff on this round with Narada Michael Walden demolishing the drums in the most extreme Jazz-Rock fusion style imaginable.